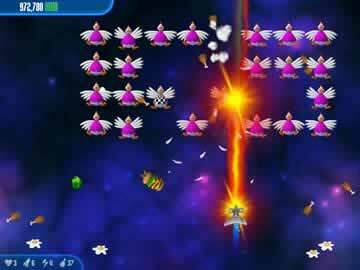 Chicken Invaders 3 Game Review - Download and Play Free Version! Enjoy the hilarious, fast paced shooter that will keep you entertained for hours! Classic arcade game with a fun and humorous twist. 120 waves of chickens to destroy. You don't think much about chickens. For centuries we have oppressed them, grilling, roasting, stewing, and stuffing them in buns. We should have known they wouldn't put up with that forever. There would be revenge. Now is that time. 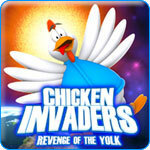 Now its Chicken Invaders 3 Revenge of the Yolk and the chicken wrath is worse than ever. Once more, it's time to don your teflon-coated, egg-repulsing helmet and fight for our ancient right to omelettes and chicken nuggets at the drive thru. Only you can make a difference and save humanity from our favorite food source. Will you succeed? Will the future of chicken burgers be secure? Or will you end up as part of the menu in a galactic chicken restaurant? You won't play through Chicken Invaders 3 Revenge of the Yolk quickly. 120 waves of the meanest chickens you can imagine are ready to fry you in your seat. Tough boss chicken await you every few waves. Do you have the skills to barbecue these menaces? Play through the game enough and you might find all 7 awesome weapons, each with 11 upgrade levels and a secret 12th power level that is sure to obliterate the chickens with ease. You also might discover 7 hidden secrets secretly stashed in the game for you to un-secret. So get going, save earth from this horrible terror! Chickens are threatening Earth once again and it all falls on you to defeat the chicken menace. 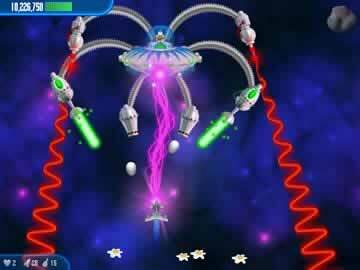 In Chicken Invaders 3, you will battle your way across the galaxy fighting wave after wave of chickens. This arcade style shooter is in the style of the classic Space Invaders. With a unique humor element this game will provide you with plenty of entertainment and laughs. Who Doesn't Want to Blast Giant Chickens? Chicken Invaders 3 starts with you fighting a giant chicken, and when you defeat the giant chicken you encounter a Yolk Star. The Yolk Star is a planet in the shape of an egg. You are then forced into a black hole that transports you 100,000 light years to the other side of the galaxy. After this, your goal is simple, fight your way across the galaxy to save earth. Along the way you will have to fight nearly endless waves of chickens and dodge asteroids. Boss encounters await you at the end of each set of waves. The gameplay is relatively simple, all the controls are done with the mouse. Movement is linked to the movement of the mouse, left clicking fires your main weapon and right clicking fires a missile. When you kill a chicken one of three things will normally drop: Various food items, coins, or weapons. Gathering food grants you an extra missile when you obtain enough. Coins add to your score and weapons either increase your current weapons power or change to a new weapon. Most chickens drop multiple items so you will be showered with hamburgers and coins on a regular basis. Each level consists of a number of waves, most include some witty comments at the start such as the warp speed chase level. Each wave increases your warp speed until warp 9.9 when it reads “she's breaking up captain”. The game is full of humor and pop culture references like that. The graphics aren't amazing, but they add to the humor. Cartoony is the best way to describe the graphics in Chicken Invaders 3. The chickens are rotund and silly looking, you will even occasionally pass through bonus levels with treasure chests floating by. The sound can be humorous at first but can quickly become annoying. Each time you pick up food it makes a crunch, every time you shoot a chicken they squawk. While the sounds are funny at first, after 120 waves of them you might find yourself turning off the sound effects. The biggest drawbacks to this game aren't that severe but they do present problems. A lack of difficulty settings forces everyone to play at the same level. While this game is not hard at first and it increases in difficulty as you progress it might still be too hard or too easy for some players. Difficulty settings are always a good idea in a game. Another problem is the repetitive gameplay. Most levels are very similar. The main differences are how the chickens move about the screen. Other than chickens you will have to dodge asteroids. A lack of level variety could cause some to become bored with this game. Overall Chicken Invaders 3 will provide you with an entertaining and humorous experience. The subtle references and hilarious chickens will keep you laughing while you destroy wave after wave. If you don't mind a little repetition, or if you really enjoy Space Invader style shooters, then this game is definitely for you. With the super easy controls anyone can learn this game and be successful. Player created Chicken Invaders 3 video showing a funny cut scene and a couple fighting levels.